Yesterday my daughter gave me a wonderful gift. 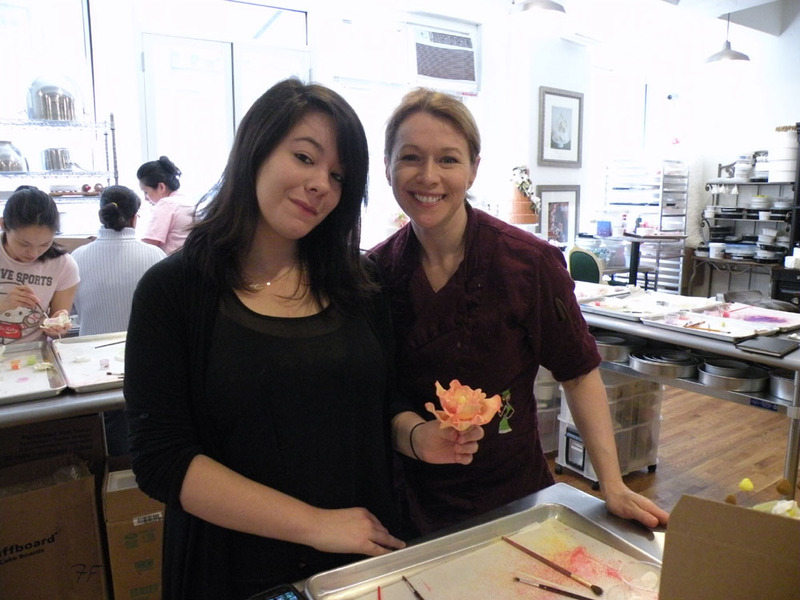 She arranged for us to participate in a gum paste flower class for beginners at Sugar Flower Cake Shop, a renowned wedding cake shop in NYC which is owned and operated by Amy DeGiulio. The two hour class taught by Amy was attended by approximately twenty people. Her assistants were on hand to help all of us get the gist of using the tools and performing the tasks correctly. Amy came by our station quite frequently to check in on our progress. She is very patient and answered every question posed to her. Amy introduced us to gum paste. I don’t really know what I was expecting but I was surprised that the gum paste looked like a brick of cream cheese with the consistency of play dough. We were instructed to cut a small piece of the gum paste, knead it and then roll it out to a thin rectangle. Next we took our pieces of dough and put them through a pasta machine, the reason for this step is to ensure that the thickness of the dough would be uniform. Then we used cookie cutters to cut out circles in three graduated sizes that were placed on what looked like a Lucite board which was covered with another layer of Lucite so that we could work on one petal at a time without the others drying out. To make an individual petal we took one small circle and inserted a piece of floral wire into one end so that it resembled a lollypop. Then we crimped the outer edge between our fingers to make it thin and somewhat wavy. 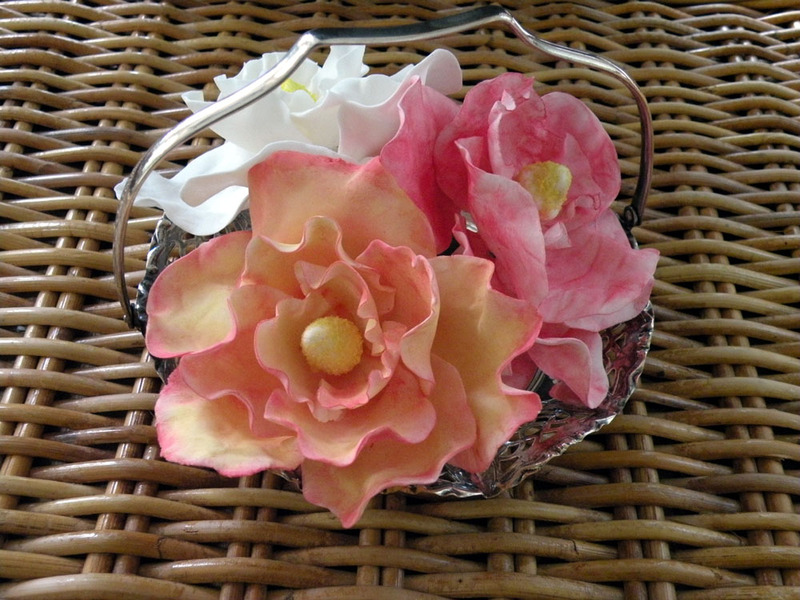 The “petal” was placed on a teaspoon and tapped into the bowl of the spoon so the outer edges formed a ruffle. The stamens were formed by taking a small piece of dough, forming a ball, inserting a piece of floral wire and then shaping the ball into somewhat of a miniature Hershey’s Kiss. The petals must harden for about 24 hours. Because of the limitation of time allotted for the class we were presented with petals that were made by another group so that we could complete our project. Some people, including my daughter, were a bit disappointed that their flower was not all of their own work. I took this in stride because it is not practical to think that the class should stop at this point and reconvene on another day when the petals would be dry. The fun part, assembling and decorating our flowers! We took one stamen and overlapped three petals to form a circle around it. 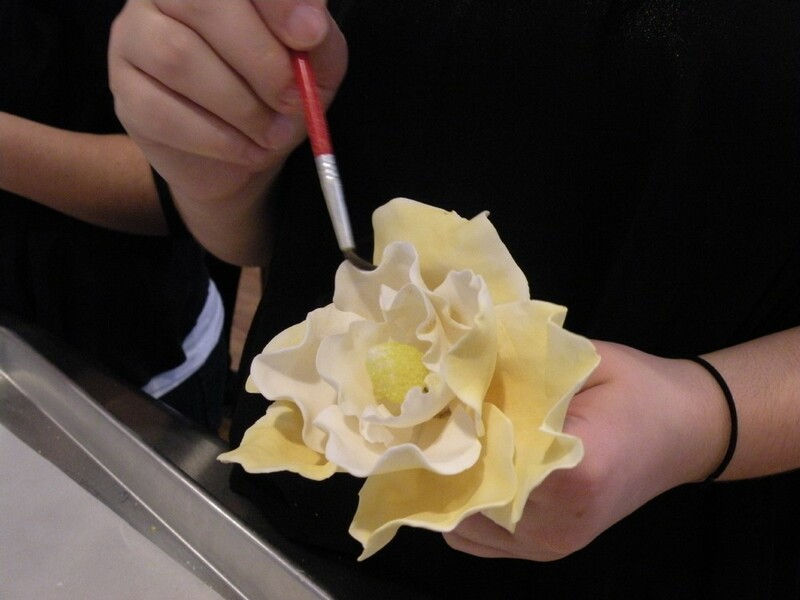 We wound the floral tape around the base of the flower and secured each additional petal with the tape. Repeat this technique for each layer and increase the number of petals by one. The final step in assembling the flowers was to wind the floral tape down the entire length of the stem. The flowers were decorated with powdered food coloring in a matte finish. This gave the students a chance to be creative and some of the flowers were outstanding. I am proud to say that Rachel’s flower was the prettiest of all the flowers made during our class. Of course, bear in mind that I AM her mother and I always think that everything she does is spectacular! 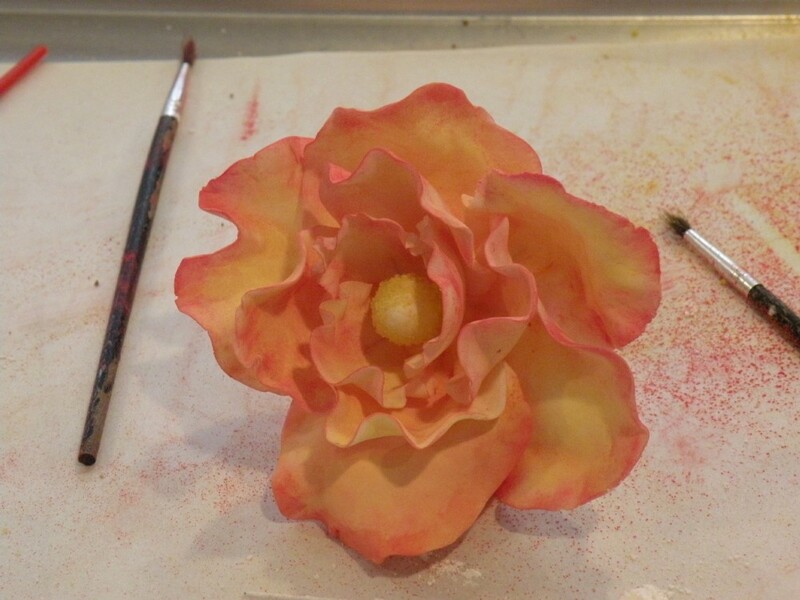 Please leave a comment to let us know what you think of our first attempt at making gum paste roses.